Johann Henrik Carl Berthelsen was born in Copenhagen on July 25th, 1883. He emigrated with his parents to America at the age of seven – an immigration listing reports his arrival in the United States on September 6th, 1890, at the age of seven, most likely not 1889, as has been previously recorded. When he was eighteen years old, Berthelsen entered the Chicago Music College with a full scholarship to study voice. He remained there for four years, graduating in 1905 as a fully trained baritone. After graduation, Berthelsen joined a light opera company and began touring throughout the United States and Canada. He spent a long five years in the limelight of the theatre, until 1910, when he returned to his alma mater to join the faculty as a voice instructor. Berthelsen would remain in this position until 1913. In 1915, Berthelsen left his position at the Conservatory to open his own studio where he offered private voice lessons and produced student performances as well as appearing in his own concerts. In addition, Berthelsen became an active member of the Little Theater Society, where he often had a leading role. During his tenure in Indianapolis, Berthelsen and Adams became close friends, and in 1920, they decided to move to New York City to be part of the thriving arts community there. 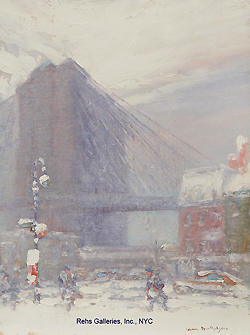 It was at this time that Berthelsen began painting his most recognizable images: those of New York City, with its steel skyscrapers and vibrant city life, shown with a sensitive rendering of changing environmental elements. Adams commented about his reactions to his friend’s paintings. New York was becoming a major artistic center in the 1920s. The city itself provided an opportunity for artists to create captivating images of progress and modernization. 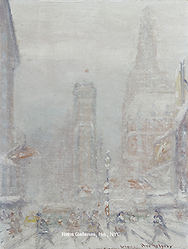 Paintings of urban cityscapes began in the wake of the poet Charles Baudelaire’s exhortation to “be of your own time” (Il faut être de son temps) in mid-nineteenth century France, but the images produced by American artists taking on the Impressionist palette and subject matter were tinged with a sense of nostalgia and the search for an appropriate method of representing the American cityscape and way of life. After arriving in New York City in 1920, Berthelsen again opened his own studio where he gave voice lessons, but which also allowed him to continue painting. Both he and Adams had studios on West 57th street. Berthelsen experimented with several media during this period including pastel, watercolor and oil; he became a member of the American Watercolor Society in 1926. The artist also maintained his ties to Chicago, earning his first official recognition there for a pastel of Central Park; the pastel was entered in the Hoosier Salon Exhibition—which was held at the Marshall Field Company galleries in Chicago in 1928. 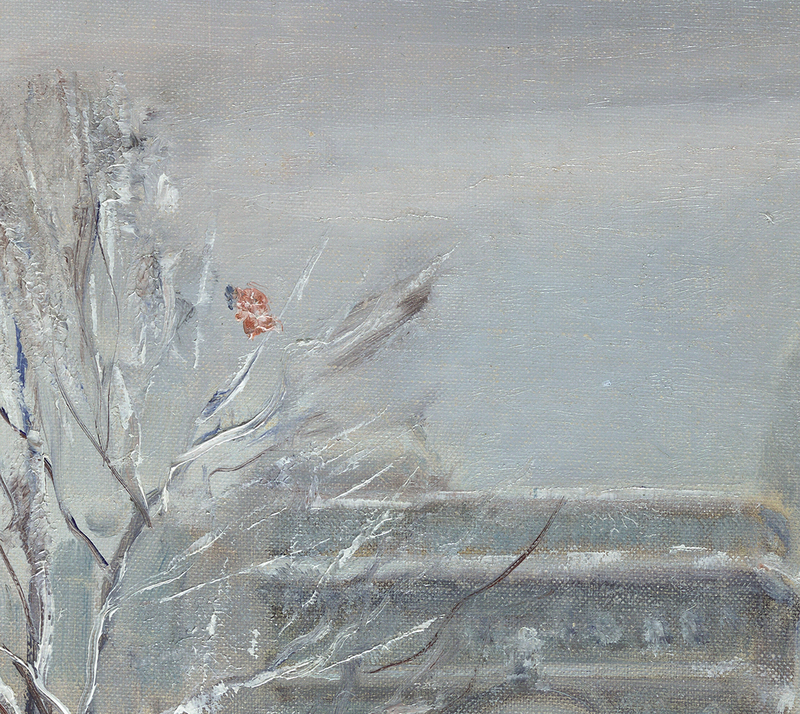 [iv] There he received the Albert Erksine Prize for Pastel. The year 1928 was also marked by Berthelsen’s marriage on March 15 to Helenya Kaschewski, who had studied with him before embarking on a career as a singer, dancer and entertainer. Ultimately, the couple had three children, two sons and a daughter. In spite of the happiness of their early years of marriage, they Berthelsens faced the economic disaster of the 1929 stock market crash and the subsequent shuttering of many Broadway theatres and other performing venues. Music students could no longer afford lessons, and performing jobs grew increasingly rare. Berthelsen turned increasingly to the sale of smaller format images, which he was able to sell for lower prices. Gradually, he began to build a reputation as an artist, and particularly as a painter of New York cityscapes. His most popular images were of the city in the snow. Berthelsen was also fortunate to participate in one of President Roosevelt’s New Deal art projects, the Municipal Art Committee in New York City. Together with eleven other artists, he exhibited at the Committee galleries at 62 West 53rd Street. His mature style shows the influence of previous American Impressionists such as Childe Hassam, but also recalls the the lineage of Impressionism in France. While American Impressionists may have adopted the French style, it came with new and fresh interpretations. Art historians Weinberg, Bolger and Curry identified the issue issue succinctly in their discussion of American Impressionism. 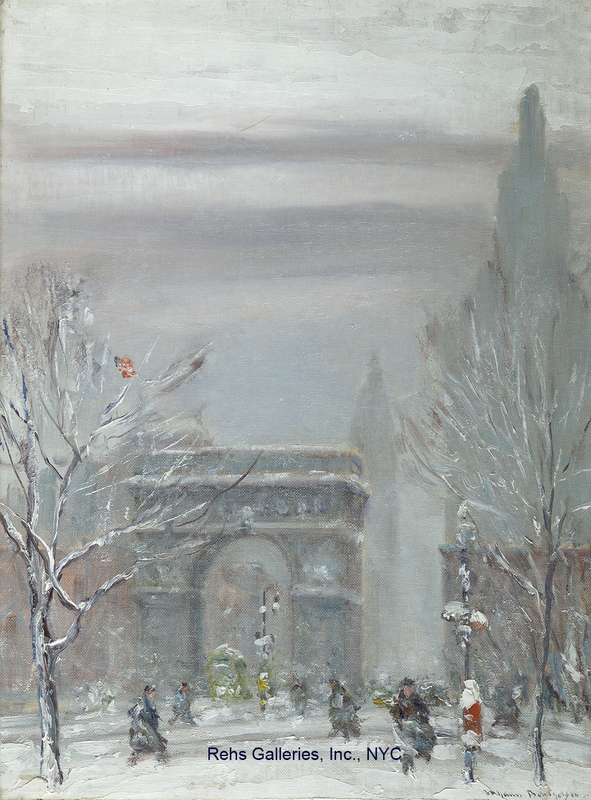 Although Berthelsen never studied in France, French Impressionist works were exhibited in America beginning with the Galerie Durand-Ruel show in 1886 in New York. 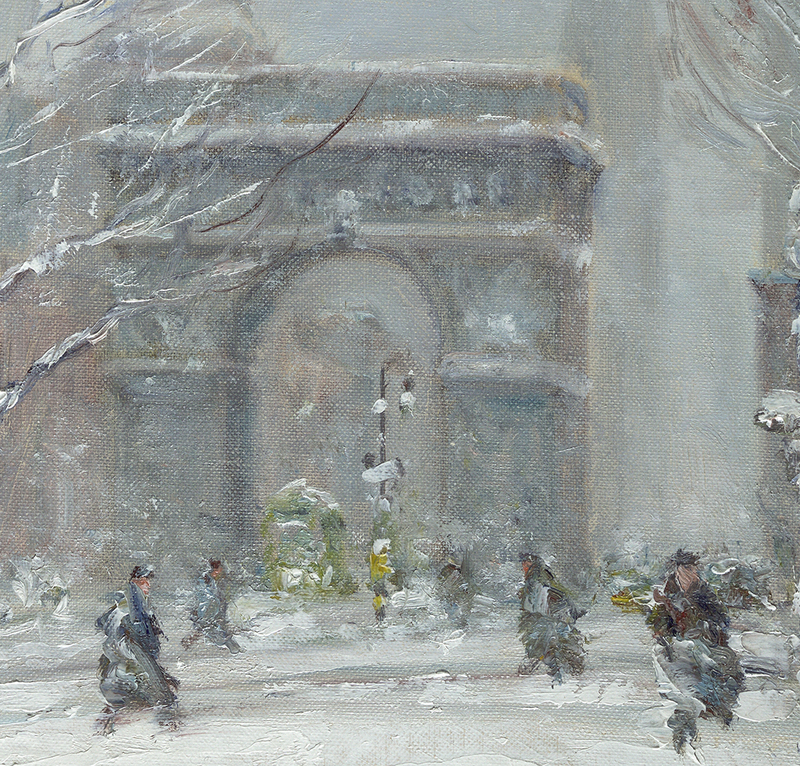 By Berthelsen’s time, French Impressionist art was shown in many galleries across the country. Perhaps more significant for Berthelesen, however, was the extraordinary collection of this work at the Art Institute of Chicago, where it formed the core of the museum collection from its earliest days. In 1942, with an growing reputation as a painter, and some well known collectors such as Willam Randolph Hearst and Richard Berlin purchasing his work, Berthelsen moved his family to rural New Milford, Connecticut. The surrounding countryside provided subject matter for new paintings, and the quiet environment undoubtedly offered a congenial place to raise a family. After the end of World War II, the US economy returned to non-military production, and collectors began to purchase art again. Berthelsen’s sales increased and the family returned to New York City in 1950. The 1960s proved to be even more successful as sales continued to expand. As their children left for for college, the Berthelsens moved to an apartment on Sutton Place and then to Greenwich, Connecticut. Between 1943 and 1960, Berthelsen exhibited often in New York, Indianapolis, and Chicago. 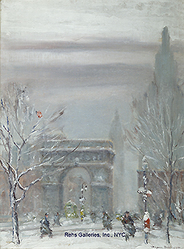 Throughout his career, he exhibited in Chicago at the Hoosier Salon and Thurbers Gallery; in Indianapolis at the Hoosier Salon; and in New York City at the American Watercolor Society, Barbizon-Plaza Galleries, Galleries of the Municipal Art Committee, Gatterdam Gallery, and Jean Bohne Gallery. He was additionally a member of the Allied Artists of America, American Watercolor Society, and Salmagundi Club. In 1971, while visiting New York City, the artist was hit by a passing car which brought about a rapid decline in his health. He continued to paint until death on Easter Sunday, 1972. [i] Leland G. Howard, Johann Berthelsen: An American Master Painter (Terre Haute, IN: Sheldon Swope Art museum, 1988) 5. [ii] Judith H. Bonner and Estill Curtis Pennington, eds. The New Encyclopedia of Southern Culture: Volume 21: Art and Architecture. (Chapel Hill, NC: University of North Carolina Press, 2013). 203-204. 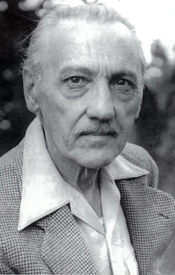 [iii] Howard, Johann Berthelsen: An American Master Painter, 6. [v] Barbara Weinberg, Doreen Bolger, & David Park Curry, American Impressionism and Realism: The Painting of Modern Life, 1885-1915, (New York: Harry N. Abrams, Inc., 1994) 5.